The AESS met at the Royal Overseas League for the AGM and Annual Dinner on March 20th. With our centenary two years away, many celebratory ideas were discussed and it was thought that all members should be encouraged to try to find one more member each in the next year. Before the Dinner, attended by 44 members and guests, consummate entertainment was provided by Marilyn Cutts, Marian Lines and Rosamund Shelley. The guest speaker was the Reverend Prebendary William Scott, Domestic Chaplain to her Majesty The Queen, who spoke most entertainingly about his life and love of speech and music. The Trustees’ Statement may be found here. This entry was posted in Past Events on March 20, 2011 by AESS. The final of the first Courtney Kenny Award for singers aged 18-23 was held at Whitgift School. The seven finalists in this year’s final achieved a high standard of performance with some innovative programmes and it was especially pleasing to hear some fine verse speaking as well as some very polished vocal work. Thanks are due to Paul Wilson who made the school available to the AESS for the preliminary round and the final and was on hand to help in any way that he could. He joined Ameral Gunson and Graham Trew on the panel for the final. Stephen Miles co-ordinated wonderfully as always and also judged the preliminary round with Rodney Gibson. 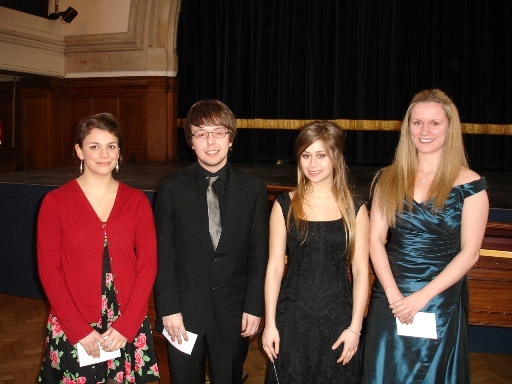 The winner of the £1000 first prize was soprano, Raphaela Papadakis, a student of John Evans (himself an AESS Senior Competition prizewinner in 2005). Second was counter-tenor Gordon Waterson, a student of Linda Hirst at Trinity Laban. Gordon won £500 as did his accompanist Melis Omeroglu. Also winning £500 was third placed soprano, Joanna Marie Skillett, a student of Elizabeth Ritchie. This entry was posted in Past Events on March 13, 2011 by AESS.